Like many European towns and cities, Bremen is in the process of producing its transport plan for the next 10 to 15 years. In the UK it is known as LTP3. 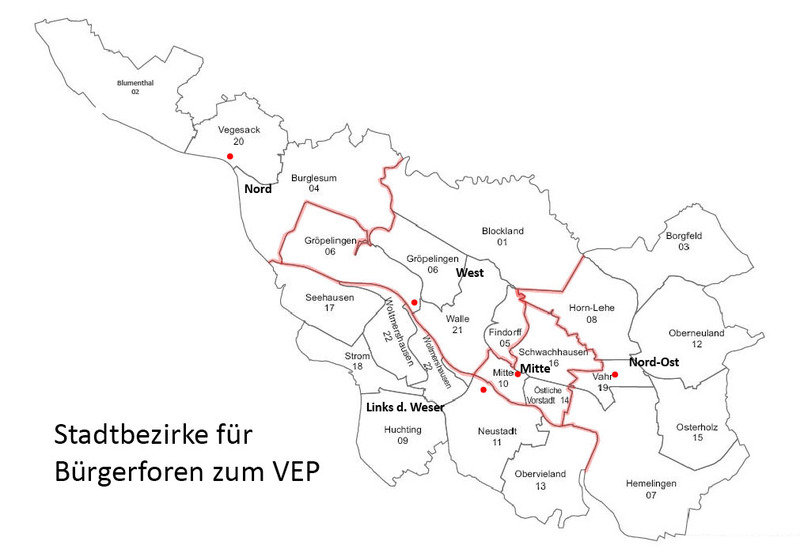 Here, using the German language’s love of crushing together a string of words into one, we called it the Verkehrsentwicklungsplan, or VEP for short. Last month, I went along to one of the public consultations to see how they compared with the UK experience. The basis of the presentation is available online here. The consultation process involves 5 sessions for each of 5 areas in Bremen. 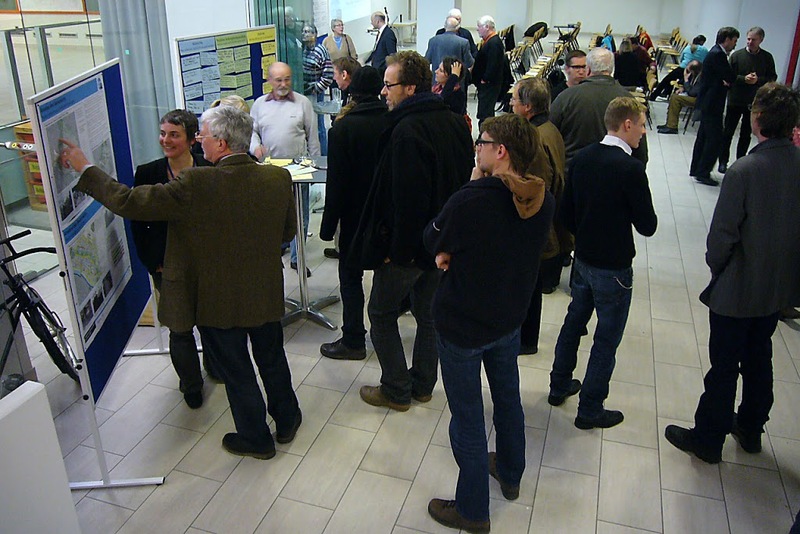 This particular meeting was for central Bremen, where we live. The first thing that struck me was that, in this city with around 25% of everyday trips being made by bicycle, cycling was given equal weight throughout the proceedings to all other modes of mobility. For example, following the initial presentations by the officers and their consultants (more on which later), the audience was given four standing areas to visit and comment, one for each of public transport, private motorised transport, walking, and cycling. In a way, it felt as though cycling was a given in terms of such status, and this time extra efforts were being made to give walking a higher status than previously afforded. 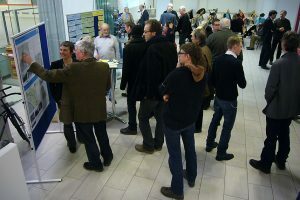 At each of these stands, an officer or consultant was on hand to discuss issues with members of the public. Alongside the maps and statistics was a blank canvas. 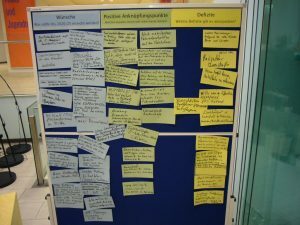 We were invited to fill in different coloured cards with suggestions – blue cards for wishes, green cards for positive aspects of the existing infrastructure that should be build on (Anknüpfungspunkte means something like starting points), and yellow cards for negative comments. The blue “wishes” cards tend to argue for more space for cyclists, the green for more priority for cyclists, and the yellow identified individual problems – cobbled streets, the technical prohibition of cyclists in the city centre pedestrian zone (most cyclists ignore this), and so on. 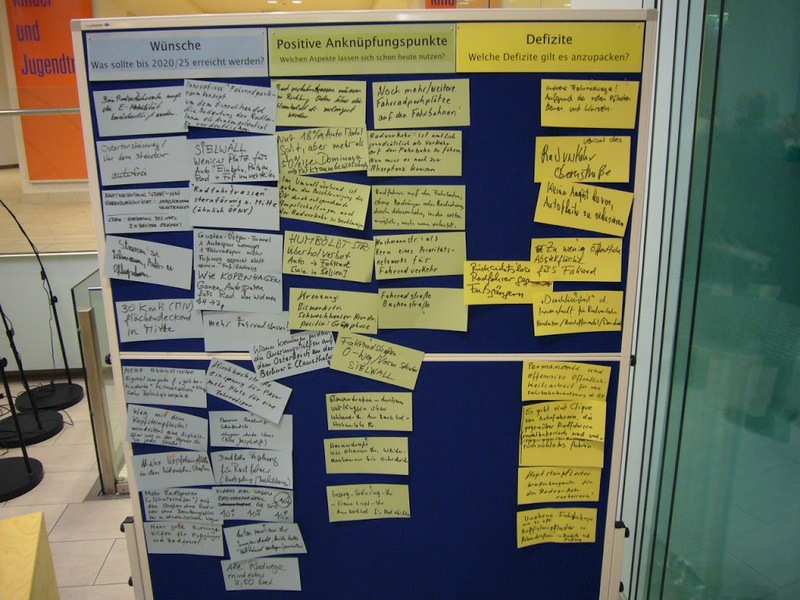 The consensus seems to be that Bremen has done well in the past, but that now a lot more needs to be done. Much of Bremen’s cycling infrastructure dates back 40 years or more – the first Bremen cycle path was constructed in 1897! Sure enough, the statistics show that, when compared to the large German cities, Bremen has the highest cycling modal share of all. But how to progress? During the initial presentations, it seemed that there was little critical contemporary evidence about cycling figures, whether they were rising or falling, who was cycling where. The available figures date back to 2008, now nearly 5 years old, and make for interesting reading. 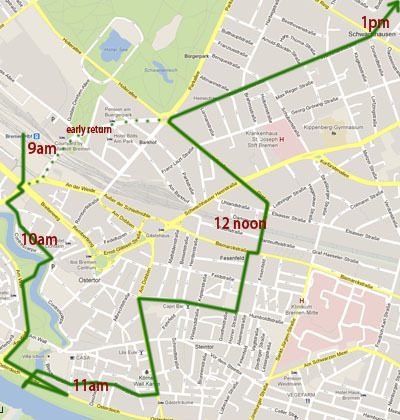 They show that, in Bremen as a whole, cycling’s share of all journeys stands at a healthy 25%. In our area, Bremen Mitte, this rises to 28%. Moreover all sustainable travel modes are higher than the Bremen average in our area. 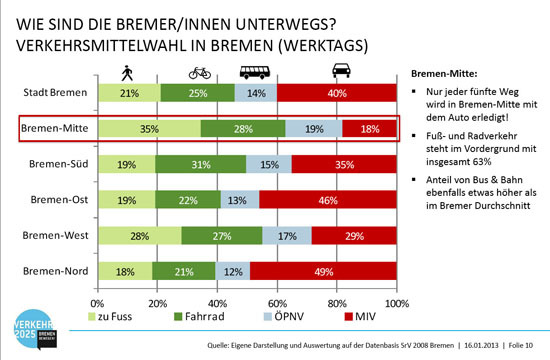 In contrast, car use in the city stands at 40%, whilst in Bremen Mitte this falls to just 18%. This is significant. 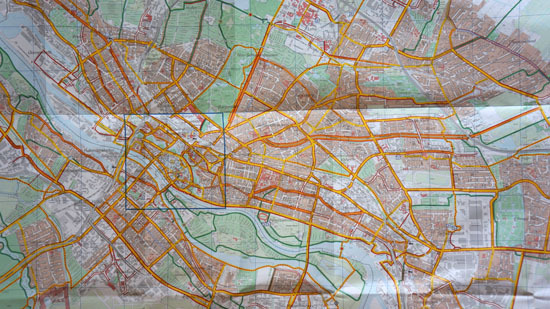 Bremen’s Modal Split. Our area is highlighted in red. We often hear from politicians in the UK that they are restricted in what they can do for cycling because of the democratic process. The argument goes something like this. “In a democracy politicians have to take the views of the electorate into account. If most voters drive rather than cycle, and cycling is in fact the domain of a few per cent of the population, then clearly the needs of motorists have to take precedence over cyclists. Thus, in a democracy, streets should be designed with the typical voter in mind”. Something like 30% of the available street space, once pavement and road are taken into account, is allocated to parking for cars. This is a relatively quiet residential street, and because there are so many cyclists compared to drivers, most of the time cyclists feel safe to use the road, with car drivers accepting they should follow slowly (it is also a 30kph zone). All the same, it does seem rather generous to the 18% to give them so much space simply to park their tin cans. But the problem becomes acute when we look at the road at the far end of this picture, Sielwall, which is deemed a main through road with a 50kph speed limit. As this is a busier road with a 50kph speed limit, a cycle path runs along both sides of the road. But as you can see, parked cars tend to edge into the already too narrow path. The blue parking sign at the top of the picture instructs drivers to park partly on the road way and partly on the narrow strip of pavement between cycle path and road. But in practice, drivers move most of their vehicle up on to the pavement, probably in fear of their wing mirror getting clipped. Parking on this stretch of street amounts to around 20 spaces, yet it disrupts the safe flow of traffic for both cyclists and pedestrians alike. Interestingly, there is a clear aim in that document to “shift private motorised transport towards public transport“, but there is no apparent equivalent for cycling. 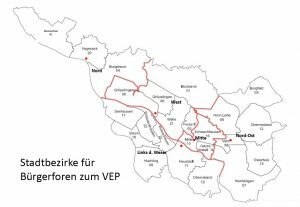 It is fair to say that the VEP’s concrete project proposals will be developed over the coming months, so there is an inevitable vagueness about things to date. Moreover, there are a number of wider aims, for example dealing with environmental and urban planning issues, that suggest that cycling has a wider role to play. But even so, there is surely space for a clearer cycling strategy at this stage. 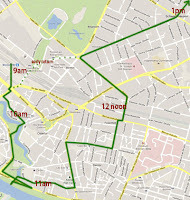 Bremen is often characterised as a “leading” cycling city, on the verge of becoming classified as a “cycling champion” or “pioneer” (the German national Cycling Plan’s term) by the professionals. Indeed, the EU-funded PRESTO project has already done so. In these circumstances, perhaps two questions need to be asked. First, how do we keep existing cyclists happy on their bikes? Second, how do we raise that modal share figure further? According to Germany’s current National Cycling Plan, pioneer municipalities like Bremen have little need for promotion – cycling as an everyday means of transport is self-evident – but rather needs to concentrate its efforts on infrastructure projects. It also makes sense, when so many of the complaints from existing cyclists relate to the inadequacies of Bremen’s ageing cycle paths, that priority is given to upgrades of existing infrastructure. For example, Copenhagen’s Bicycle Strategy 2011-2025 includes a target that “80% of cyclists find the cycle tracks well maintained (2010: 50%)“. So far in Bremen, such an approach, to upgrade existing cycling infrastructure, does not appear to have been adopted. But attitudes towards Bremen’s ageing cycle paths, and how problems such as that highlighted on Sielwall, constitute the key debates around Bremen’s cycling vision. How that debate is resolved will have a major bearing on whether Bremen moves forward as a cycling champion, or sees its long history of everyday cycling eroded just when the wider world has woken up to its significance.